I wanted to write on something fairly light and fun today in light of recent events in the Middle East and in Europe. So, today I wanted to shine a light on Pokemon Go, the augmented reality mobile app that has become a global sensation (and if you’re asking what is Pokemon Go, where have you been for the past two weeks?). 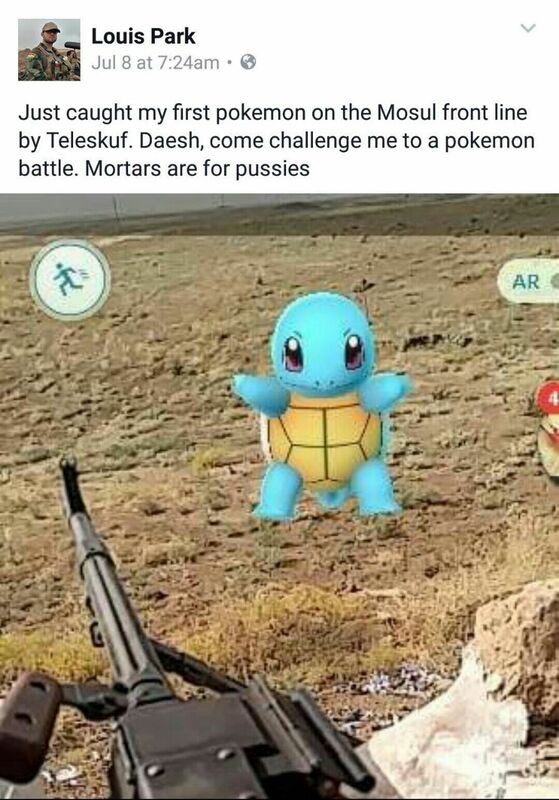 While Pokemon Go hasn’t been introduced into the Middle East officially, people are already playing the game here. And advertisers and brands are also reacting to and using the sensation to market their products. Probably first out of the blocks were, unsurprisingly to me, the Saudis. Two of the Kingdom’s telcos put out adverts promoting the craze, which isn’t surprising considering that you need a mobile and a data connection to play the game. 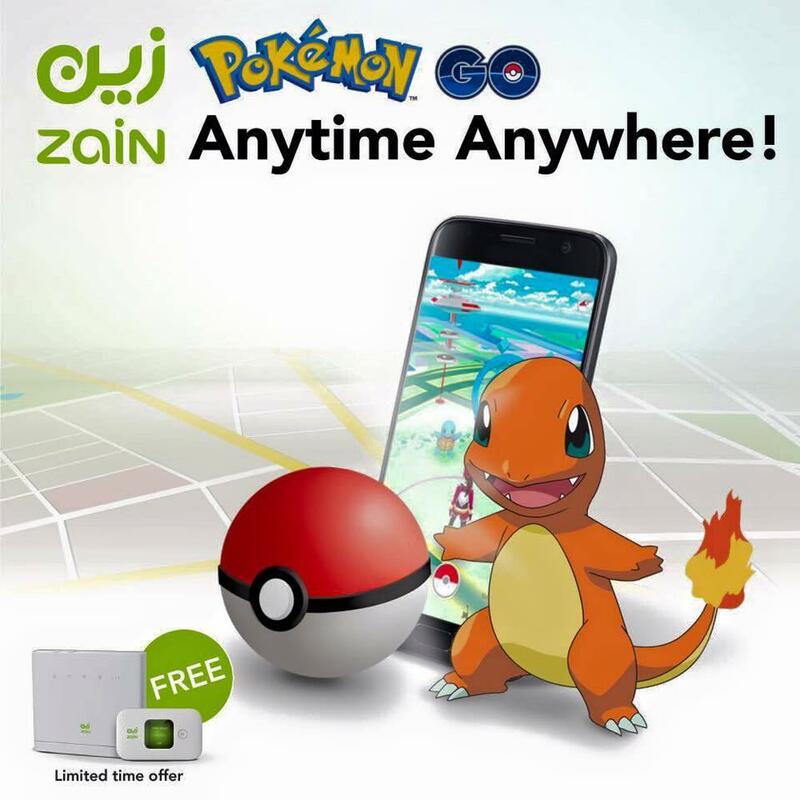 Saudi telco Zain became the first household brand to use Pokemon Go when it ran this advert across its social media channels early this week. Other brands have also looked to leverage off the lovable Japanese characters. 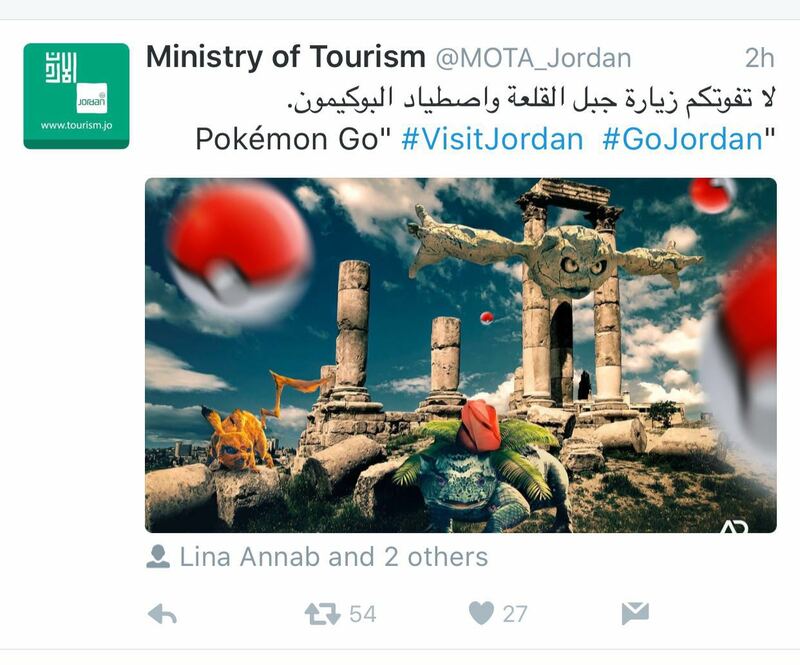 Cab booking service Careem ran out an ad, as did Jordan Tourism. The game uses geotargeting to get people walking around a physical environment such as a city, and brand whose services include travel and tourism (or any location-based product) are fast realizing the potential of getting players to visit their premises (or even country) to hunt the digital creatures. Users have also been having fun and sharing their own experiences online. Some have been sharing their experiences, including one apparently from the front lines in Iraq and others in more mundane locations, including finding a Pokemon on top of a plate of Kunafe. It’s enough to put you off your dessert! 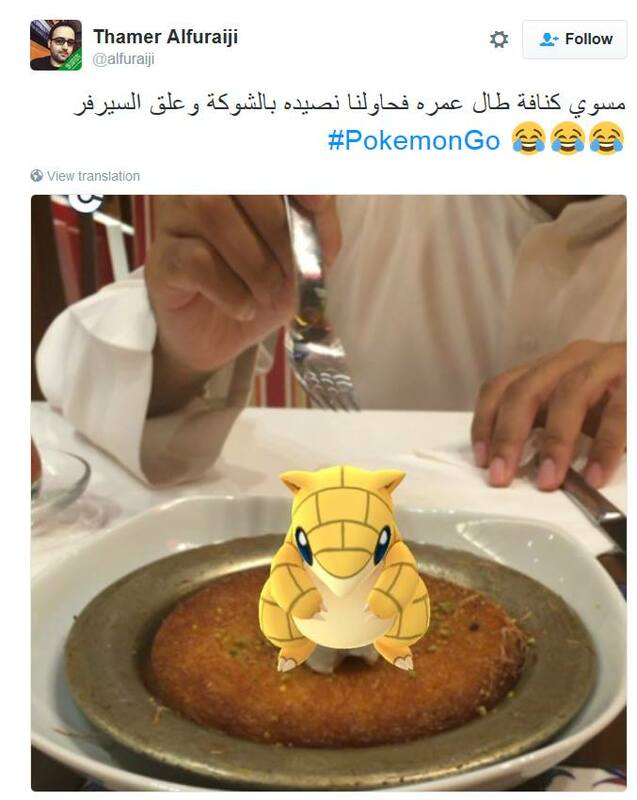 A Pokemon on top of a plate of Kunafe (image thanks to Samer Batter). The craze and people’s reaction to it in the region has been picked up by local media. Reports have circulated that people have ventured into all sorts of places as part of the game. Two cartoons below best sum up that sentiment. The craze hasn’t been without controversy. 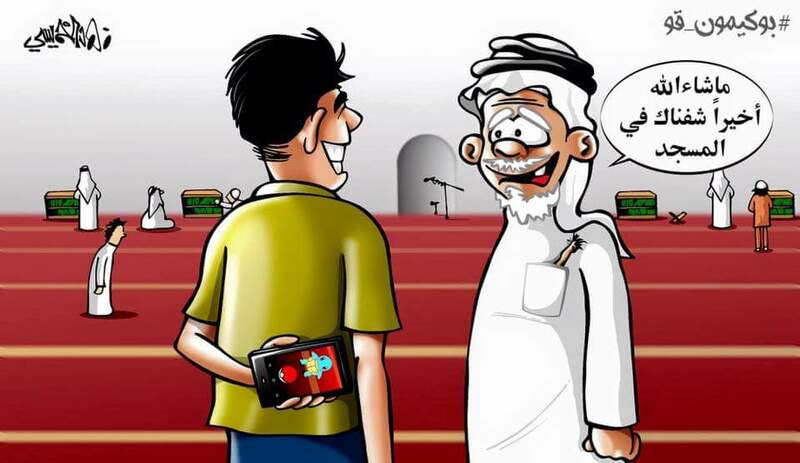 According to Gulf News, Al Azhar, Egypt’s top Islamic institution, has condemned the craze about Pokemon Go as “harmful mania”. “If such a game can deceive youngsters, I do not know where the minds of adults have gone. They can be hit by a car while being busy searching for Pokemon,” said Al-Azhar’s Deputy Abbas Shuman, according to Gulf News. Al Arabiya reported that Egyptian cabinet spokesman Hossam al-Qawish said that an investigation into the game’s dangers was taking place. The spokesman added that the government was also considering new regulations to be imposed on online games to limit possible threats to national security. In addition, Gulf News reported that the UAE’s Telecommunications Regulatory Authority (TRA) has warned that criminals could exploit the popular Pokemon Go mobile game. Kuwaiti authorities have also warned against those who take photos of sensitive locations in the country. Brands promoting Pokemon have also been targeted, with the likes of Dominos Pizza and others called into question by those who consider Pokemon to be a work of the devil (if you don’t believe me, see below). 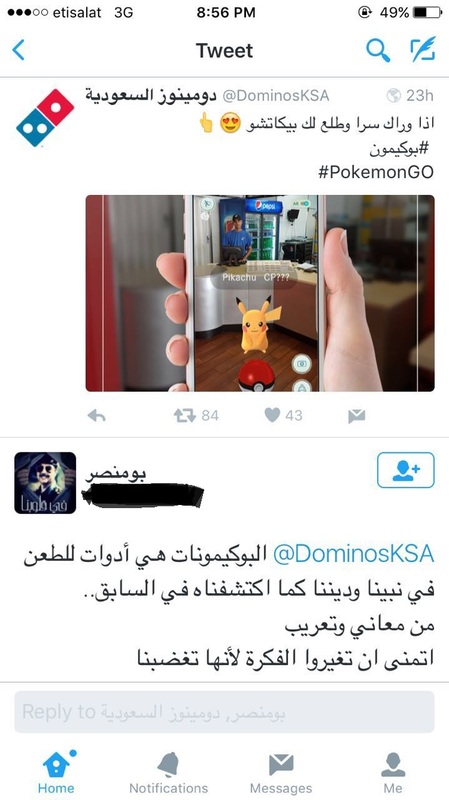 Dominos Pizza’s efforts to use Pokemon as part of marketing were called into question by one user, who claimed Pokemon were tools of the devil against Islam. The user told Dominos to change its marketing or risk angering the public. There’s no doubt that the Pokemon craze will continue for some time to come, and will only become more intense/insane when the app is officially launched in the Middle East. Pokemon advertising has been used smartly to get a younger audience to engage with traditional organizations such as museums and promote small businesses. Let’s hope that marketers here are just as savvy, whilst being aware of local sensitivities. 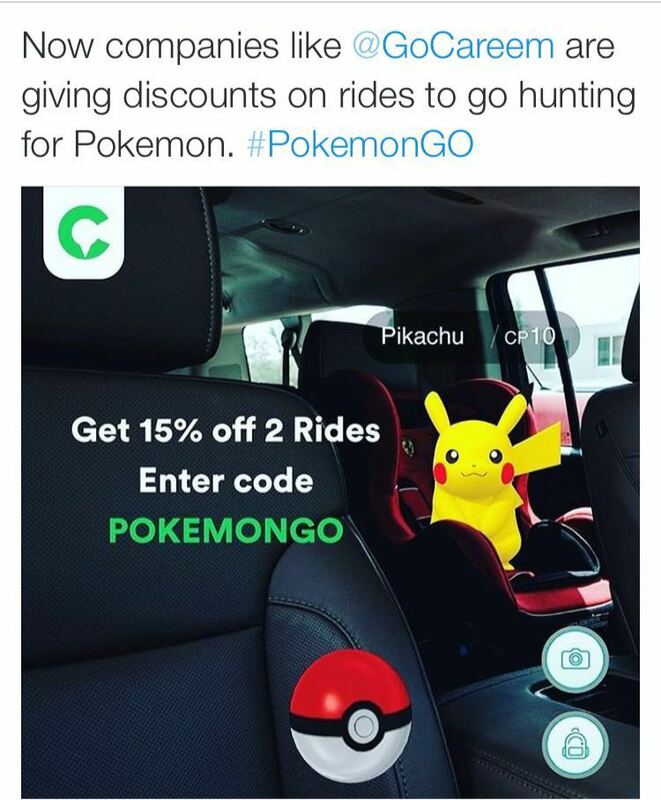 If you’re not already doing it, get ready to go catch some Pokemon adverts in your vicinity soon! And as an extra treat, here’s one television news clip on Pokemon from Kuwait, with a particular focus on how its turning youth into addicts. Here in the Gulf we just love our pictures and photos. We love it so much that you’ll be hard pressed to find many in the Gulf who aren’t on the social media app. Only yesterday and in a period of less than five years Instagram announced that it had crossed the 400 million user mark (the app added 100 million users in the last 10 months alone). Seventy five percent of those 400 million users live outside the US, and the Gulf in particular has taken to the photo and video-sharing application. In terms of the Gulf, it’s no surprise that Saudi leads the way – there are 10.7 million monthly active users in the Kingdom (just over a third of the population). The UAE follows with 2.2 million monthly users. And, to the West, Egypt has 3.2 million monthly active users. What’s even more impressive is daily active users – a whopping 6.1 million for Saudi, 1.2 million for the UAE, and 1.1 million for Egypt. This all makes good news for Facebook, Instagram’s owner, which introduced advertising to the platform this month in the MENA region. Facebook rolled out advertising for select partners this month. The launch earlier this month included both regional brands such as telcos Saudi Telecom and Zain and retailers Souq and AlShaya, as well as global advertisers such as Unilever, P&G, Nestle, Mondelez, Visa, L’oreal and Pepsi. 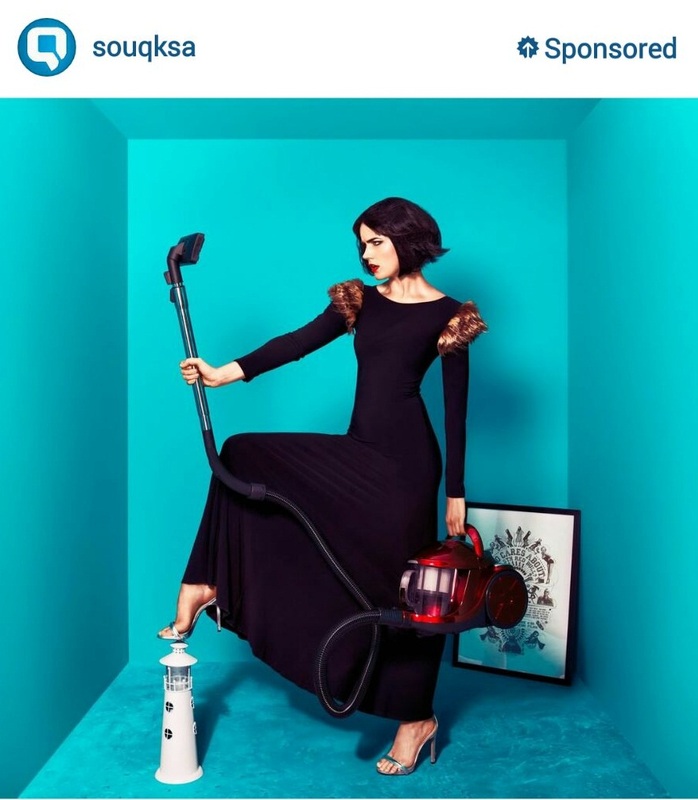 The first ad to go live was Souq’s, which you can see below. So far, from what I’ve been told, engagement with the adverts has been far higher than expected and much more than these advertisers are used to on Facebook. While there’ll be some negative sentiment from consumers who aren’t used to seeing advertising on their Instagram feeds, it seems that both Facebook and advertisers are onto a winner when it comes to Instagram advertising. PS For disclosure, I’m a P&G employee.